Good evening, good morning, or whatever it is you are experiencing at this particular moment. You know when I write these announcements, store things and little blurbs one of the things I hear from people time and time again is that they enjoy them because it just feels like I’m talking to them. Like two old friends sitting down to share a cup of coffee in the morning. Nothing special, but it feels familiar and comfortable even though we really don’t know each other and don’t really converse outside of these little things I ramble on about with you. I approach my store and my life much like this everywhere. I share and give and show people who I am often. It isn’t all just business though that is far too often the case. This past weekend my grandmother died. She was 86 years old and one hell of a crazy person. A mixture of cruelty and genius depending on what side you knew of her. Right after Thanksgiving we found out she had been in the hospital, and the morning of the 27th we found out she was on a downward spiral and in ICU. It wouldn’t be long we were told, they were just trying to keep her comfortable. We made plans to go to see her, driving the 3 hours to pick up my mother to take her to the hospital so we could visit even though my grandmother had said to not come. As we pulled into the parking lot of the hospital around 2 pm I received a text that she had passed. Stunned I blurted it out shocked and then felt something like panic raising not sure what to do and my mother just gasped as I had very unceremoniously announced that my grandmother might be gone already. Luckily my husband swept in and took charge calmly. We went inside and asked to see her or what room she might be in. The instant look of compassion on all of the nurses at the station cementing what we already had been told they gently asked if anyone had talked to us yet. She was still in her room and we were allowed to go in. A few family members were there and there was my grandmother in her bed propped up as if she was napping head turned to the side, sheet tucked up close to her shoulders. Turning back to look at my husband tears gathering I could see the pain in his eyes as he took on some blame for not getting us there sooner telling me more with that look than any words might have expressed I struggled, swallowing trying to get around the lump in my throat as my mother began to cry. Walking towards the bed I looked down at her wanting to touch her but afraid to. Her hair was almost pure white her face peaceful but for all intent looking as if she might wake any moment. Hesitantly reaching out I touched the side of her face stroking back along her hairline smoothing her hair for a moment my lips quivering… quietly caressing her face. Pulling back my hand to rest it upon the rail after a few moments at the side of the bed I looked down at her silently, studying her. Taking in each crevice and wrinkle knowing it would be the last I saw her. Stepping back my mother sitting nearby the priest came to pray over her while I held my mother letting her lean on me as she cried and my husband quietly stepping behind me to rest his hand on my shoulder. Before we left after sitting a bit my mother unable to stay any longer I had to step back to the bed to reach out a final time afraid to leave just yet… and while sadness was there and is still at times overwhelming me quickly before I realize it whenever I think I will be ok I am so very grateful to have had those moments. There isn’t to be a funeral, or wake. A service at some point but I got to have something I didn’t think I would ever have. I got to say good bye in one of the most intimate ways I can imagine. No I didn’t get to her before she passed but I got to say thank you, I got to tell her I love her, and I got to get that final memory before she was taken from us. It made me very reflective on the woman she was and over the past week I have remembered more and more from my life and of her. Reliving things, smiling about them and in some ways settled. Why have I shared all of this to you? People who barely know me and what does it have to do with my store or the item I made? How trivial it might seem but it isn’t… not to me. If you’ve gotten this far you will know soon enough why. My grandmother was an amazingly creative woman. She did pottery, glass etching, made jewelry and did leatherworking. The rugs throughout her house were braided by her and her children when they were young. She made her own clothes, adored quilting, loved to arrange flowers, garden, and cook. She was a phenomenal cook and the smells as she actually cooked things on the wood stove were amazing. She taught me to sew, to crochet, tried to teach me to knit, and all sorts of things. I learned my love for antiques from her, for finding hidden treasures, and even some of my giving nature. What you see in my store is very much influenced by things I created, learned or did growing up around my grandparents. 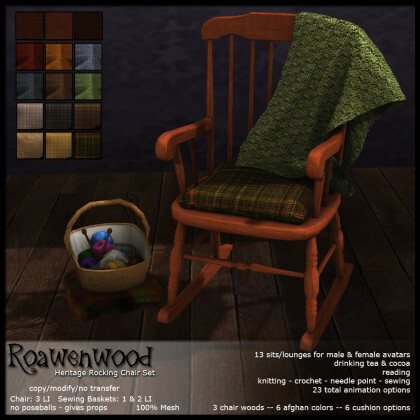 From splitting wood, taking care of the farm, to sewing, to…. Weaving. She had a weaving studio… and these great big floor looms. They were so big and I remember spending time in her studio the fire burning in the stove while I carded wool or spun yarn as she sat at her bench. The shuttle moving back and forth her feet working the pedals beneath. This week I closed my eyes and could hear the loom in my head as I relived those moments and I just had to try to do something. 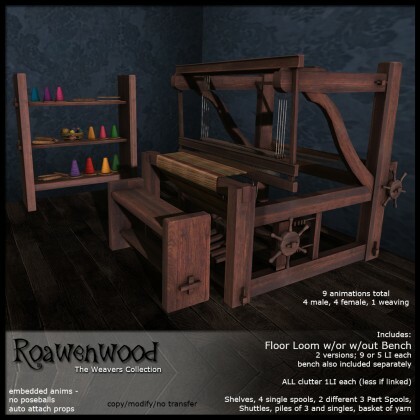 The spools of thread, the shelves, the loom…. Something in me needed to do make it and as I worked the model and it came to life I could feel the catch in my throat. I had intended on releasing something different and I still will but this round… I wanted to do something for my grandmother. So while I know it is only a model in a 3d world and one that needs some tweaking and fixes even, *laughs* I wanted to share it with you for a few moments. Thank you for reminiscing with me, for sharing with me and I’ll do a normal store blurb in a different post because not everyone wants to read my lengthy stories but if you have, sincerely thank you. I hope you are well and remember those small moments, they really are the ones that matter the most. 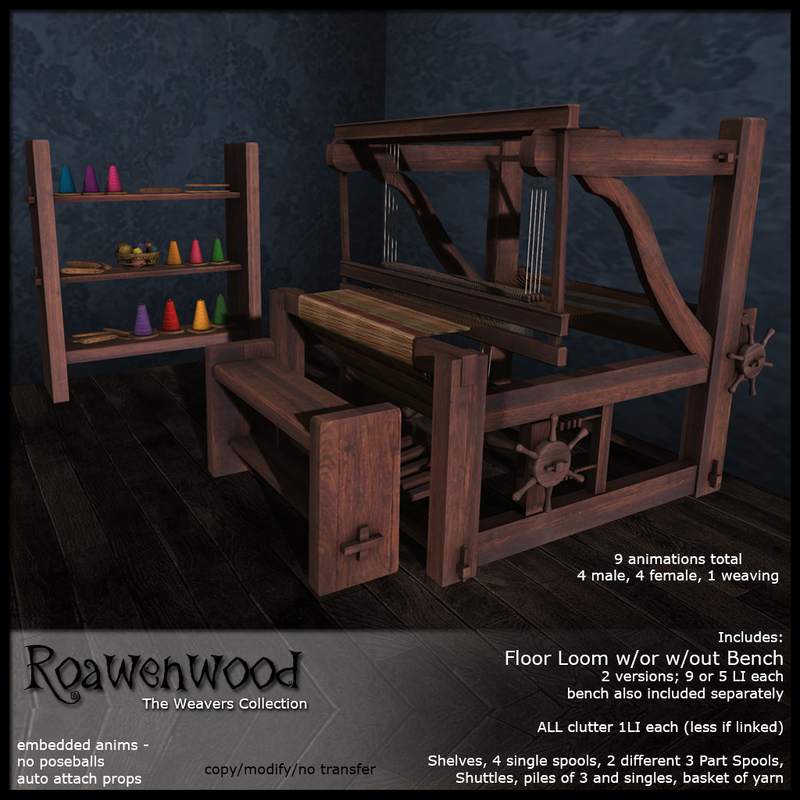 This week I got on the 25L list and while I’ve fiddled with the idea of offering items whether I’m on the list or not this week I am sooooo I decided to put together a little something. I used to have this as a set a long time ago with less to it of course, almost all my old chores and things didn’t have as much as newer ones. 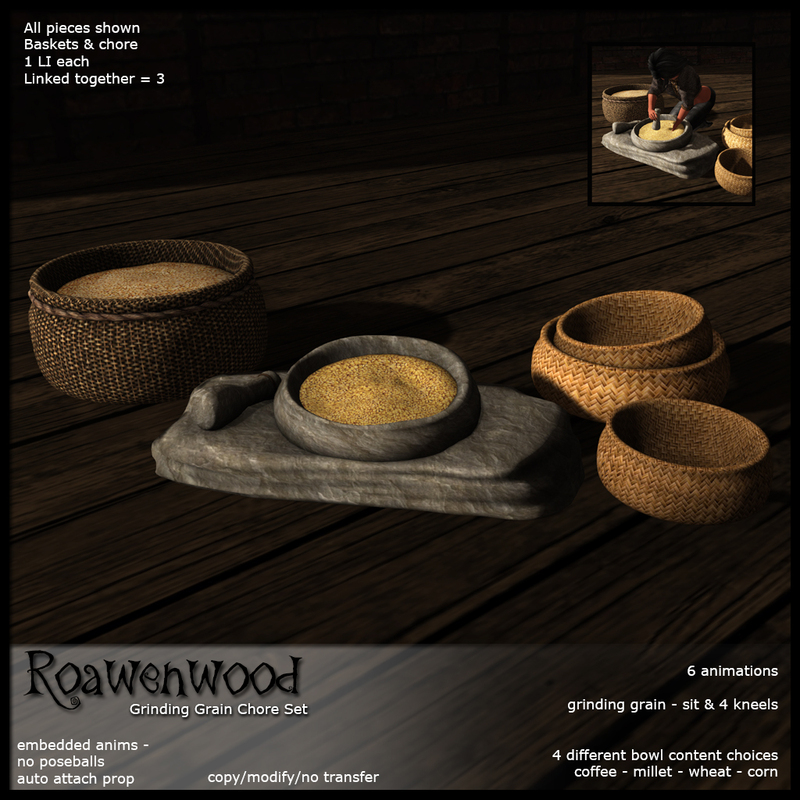 100% all in mesh and fresh out of my modeling program is a resurrected grinding grain chore. This is a bit of a rustic piece, I like the roughness of it but it could be used in lots of rp type places. This version has all that you see, dual baskets, a filled basket, and a single basket along with the chore. The chore itself has 6 animations in it instead of just one. The working animation then a few different kneels and a lazy type of bored sit. This chore set uses auto attach props AND if someone enables experiences on their sim it doesn’t even have to ask for permission over and over and over again. Totally Awesomeness. The other item I tossed out there is the filled basket with a few different fillings in it. Figured why not. Not entirely happy with the texturing on the baskets but I’m going to keep that a low end type of item so it can be an add-on rather than priced like I would normally. It’s separate from the chore because well……. not everyone really likes or wants the chore. So that’s today’s update. Two new items at 25L just for today and tomorrow because by default I leave my 25L items up for 2 days rather than one. Wayward Secrets and Affairs…. err….. New Stuff! My website was down, my database all screwed up… I wasn’t feeling good and the dog ate my homework. I swear it’s all true forget about the aliens that showed up absconding with my latest product. It was a mess! A disaster of massive proportions but I am here. Among the rubble and chaos clawing my way back to make sure I get these few little updates out there… to give you some brand new fun and flavorful things to spice up your Second Life. So what would you like to hear about first? Ahhh, well yes that’s a good choice. Do you like masks? I have not done an accessory in a very long time and with the Secret Affair opening up this past week I just decided to go ahead with it since the theme… “It’s all in the details” just begged for it. Don’t you think? I am doing something of an experiment with this one. You can do one of two things when you visit the event. You can either play the gacha that I have them in…. OR you can purchase a no transfer version set. One sticky thing though. The RARES for the gacha are ONLY in the gacha, so if you like that one you have to play it that way. I know, that’s kind of mean on my part but it does give those willing to sit there plunking away at it a something that other people won’t have. 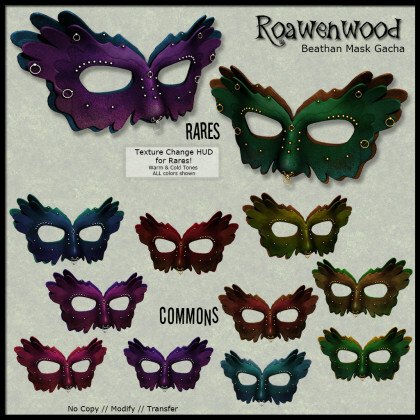 The common masks are split into two groups for the no transfer/copy version set. The warmer earthy tones and then the colder tones. I actually think this turned out pretty cool, I like them. I’m not usually one to wear masks but these I might actually if there was a call for it. Shocking I know. For the RARES there is a texture change HUD so you can mix or match the different colors making the mask a little bit more unique as well. If you don’t like masks and are in the mood for something a little more cozy I might have something for you. 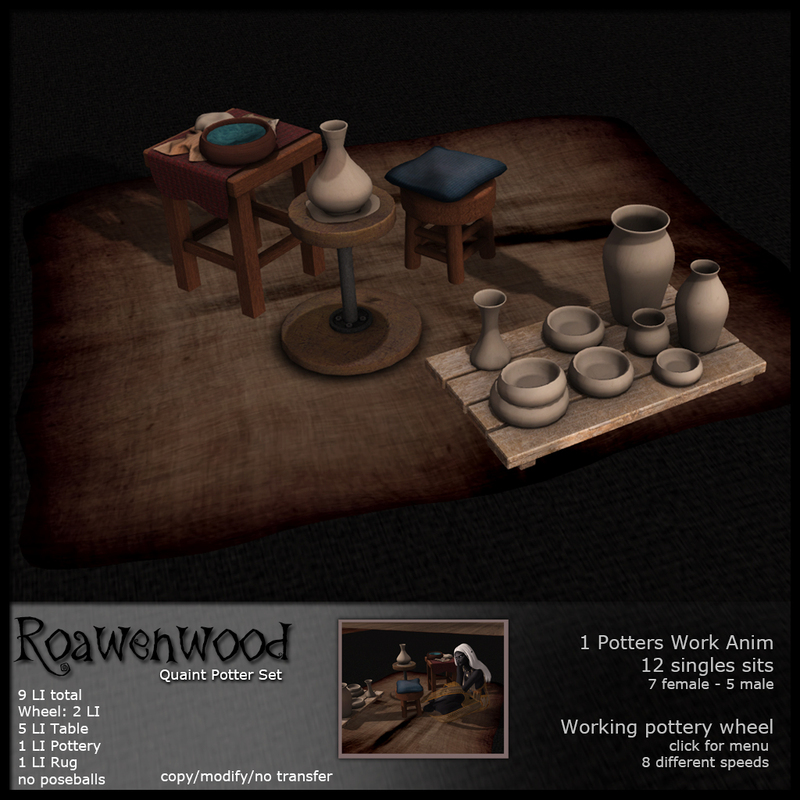 I am a part of the round for The Wayward Market this month. A lovely shopping sim with a lot of great designers that has as part of it a small little market with some amazing peoples involved. For this month I decided to go ahead and give into one of my favorites. A rocking chair. I know… I’ve done tons of these over the years, well here’s an update. Mesh, of course at this point and carefully created with a draped afghan across the back. One of the reasons I have always had these is because I just love the sitting by a fireplace knitting or something on a cold winter evening so I pass this along to you. The new set is completely redone, new props and all for sewing, knitting, crocheting, drinking cocoa, tea, and all of those fun things that I add into it. A couple new sewing/knitting baskets so you can have them if you like for decor are also included. A very lovely set, very comforting, and a favorite of mine. 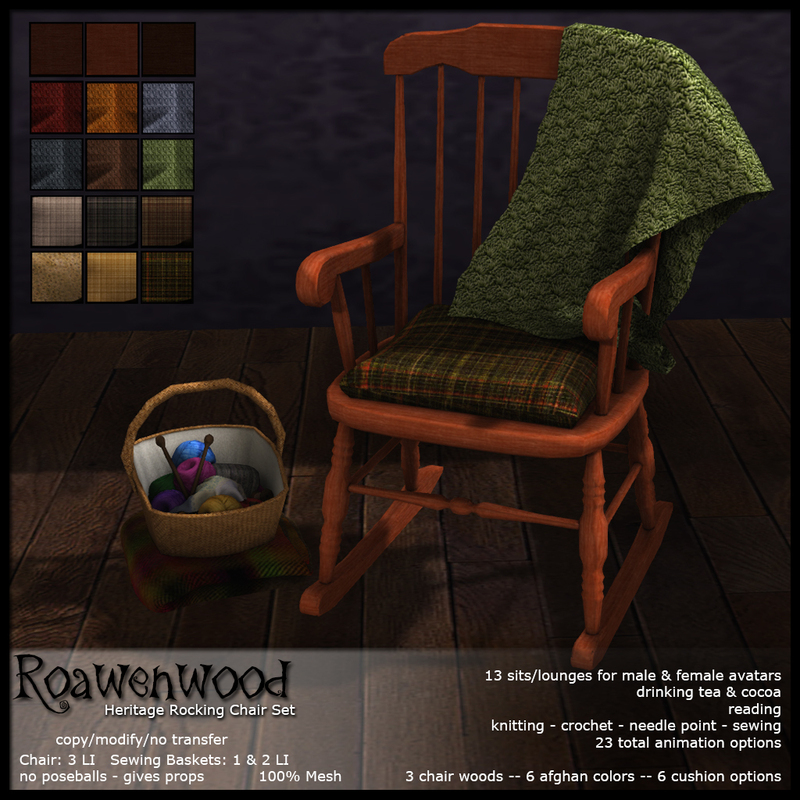 The chair also has a texture change HUD for the afghan with a total of 6 colors, the cushion has 6 different textiles and there are 3 wood options. So really you can make this look just right if you like with 23 animation options for male and female avatars. If you want this it is available NOW at the Wayward Market. Click me for a Taxi!! So that’s what I have for you for today. I’m supposed to have a few things for the 20Twenty event that opens up tomorrow. I may just update this or do a new post for later… then I’ll announce all this in world after I get all that situated, yea… sounds like a plan.